Ministry is hard work! The Bible instructs all Christians that they should endure hardness, like a good solider. Many of us do well enduring hardness because in many ways it just becomes a way of life through trials and working with people. My husband and I recently watched an of a TV show about how special operations military men get chosen to be a part of the units that turn into Army Rangers that are the best of the best within the Army. The men attempting to become Army Rangers try out for 8 weeks under very stressful situations of exercise, limited sleep, small amounts of food, and it eventually builds up to having to lead operations in the woods of Georgia and the swamps of Florida to complete a mission while explosions are going off and shots are being fired. Out of over 300 men that began the training, I believe only 90 made it. It was hard to watch the men go through the hardness of the instructors while they were physically exhausted for weeks. The purpose their instructors gave was to simulate real situations they would go through if they were a part of the Ranger operational team as well as train them to rely on the soldier working beside them completely. After watching personal interviews of several of the men and their instructors, you could see a hardness about their face. I know the life of a soldier is not easy and they see things that most Americans cannot fathom and they still go on… but you may notice spiritual soldiers in the work of the Lord can begin to hold that same amount of hardness in their face because of the battles they face from people or other spiritual matters. God allows us to have spiritual battles in our lives. Satan attacks from every angle. Personal discouragement, immediate and extended family issues, church problems, finances, you name it and it can probably become a platform on which Satan can wage a battle against you, the people you love, or the church where you serve. Life is Hard. Period. For Everyone. Ministry is Hard. Period. For Everyone. We all have an equal opportunity to endure hardness… but we will not all do it in a way that pleases the Lord. Enduring hardness means enduring rejection. Rejection of the values you hold dear, rejection of the Bible’s truths, rejection of God Himself and the priceless sacrifice Christ gave. Rejection of you personally when people decide to use you temporarily until their life gets better and they move on. More rejection of you or maybe even your spouse or children. Enduring hardness means enduring sorrow. Sorrow in knowing the consequences of sin that await those that choose the path of the foolish. Sorrow in feeling alone in the work of the Lord. Sorrow in the unknown answers of the questions you harbor in your heart. Sorrow in the losses you experience when people you serve walk away. Enduring Hardness means having faith when you cannot see. God can see all things, past, present, and future, and we cannot. We do not have the spiritual night goggles to be able to see the purposes of our trials on earth as we walk often through the valley of the shadow of death, so we must walk in faith. Walking in faith is not easy, sometimes it is like dragging our body through the mud, clutching to our firearm, keeping our head down low as the shots of the enemy fire above our heads. Faith is knowing that our spiritual safety is in God’s hand and that there are moments in time where the light of God’s Word and His Spirit will show us the answers and provide for our needs. Faith must be toward all things in this life, whether material, financial, emotional, or spiritual. Enduring hardness means extending yourself. You can extend yourself until you want to no longer give. Sometimes it is extending your time and giving people more time than they seem to be worth. It’s extending your hand to “give to him that needeth,” even when they never seem to give to anyone else. It’s extending hospitality and opening your home to people who have allowed their kids to jump all over your furniture in the past. It is extending the spiritual help someone needs to keep themselves going all while never expecting much in return. 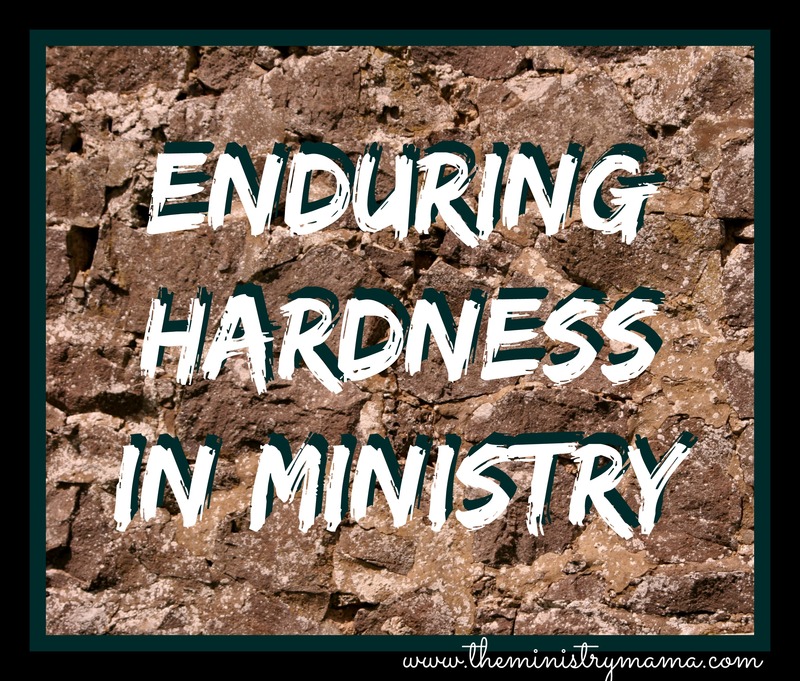 Enduring hardness means dealing with offenses. People will hurt you and offend you. The Bible says that offenses will come, and they seem to abound when you work in the ministry. They come from the most likely of sources and sometimes blindside you from the person you did not expect. We must endure the hardness of offenses and extend forgiveness often when it is not even asked for in return or acknowledged when we are sinned against. Experiencing hurt can be hard and providing forgiveness at times is impossible, until we look at Christ’s forgiveness of our own sins. Enduring hardness means identifying with Christ. Jesus Christ was the man of sorrows that endured the cross as He bore our shame. (Hebrews 12:2) Christ was persecuted, and said that when we go through persecution, it is because He and the prophets were also persecuted (Matthew 5:12). Hebrews 4:15 tells us that Jesus, “…was in all points tempted like as we are, yet without sin.” Jesus Christ came to earth and identified with man in becoming the God-Man (100% God and 100% man) and the experience allowed Him to know what it was like to be a man. When we identify with Christ through enduring the hardness of this life, then we understand Him and the sorrow He went through when He took our sins on the cross. He endured the hardest obstacle of His life, giving up the Ghost, losing His life for the sake of ours. In many ways it is hard to even comprehend, but again, it was for me and for you. How could we endure as a good soldier if we did not have a Commander that has also gone through the trenches of this life and succeeded? On the TV show that I mentioned, each instructor had experienced the Army Ranger training themselves, the real combat missions on the battlefield, and life threatening dangers, before they were allowed to become an instructor. They were able to encourage those that were attempting to complete the course because they have been through it all themselves. They were able to direct and give pointers at certain times during the course because of their experiences. Jesus Christ gives us pointers and encouragement because He knows what it is like to be in human flesh and endure the hardness of this world. What a loving God we serve! Our endurance as a good soldier pleases God, who called us to ministry. AND We have THE Hero of all Heroes to look up to! Jesus can help us to be able to endure the hardness of ministry and when God seeks to find pleasure in our work for Him then we know that our work is worthwhile. The next article in this mini-series will be about having compassion in ministry while you are enduring hardness. If you don’t already get my articles sent to your e-mail inbox, please follow me today! I also minister regularly on the Ministry Mamas Facebook page.